Bathrooms today have become versatile multi-use rooms where lighting can be critical to enhance its use. Aside from adequate light at the sink and vanity, lighting the tub area and any architectural features are also important. (Always have a licensed electrician perform any electrical work in a bathroom. 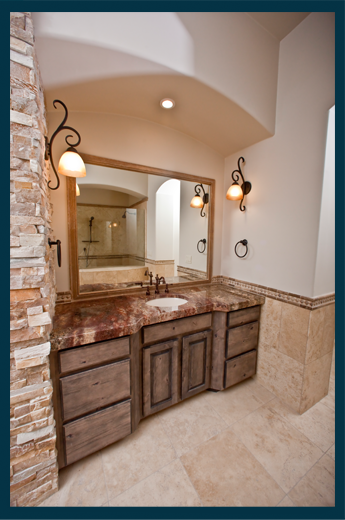 Electrical codes vary by location and safety should be the utmost concern in a bathroom.) Instead of installing a light fixture over the bathtub water faucet, add light to corners of the tub where you would place your objects d’art. Halogen lights are perfect for a bathroom and will make surfaces and objects sparkle, especially if they are made of marble or glass block. Another idea is to light the toe kick areas under the vanity or the bath tub, giving the fixture a soft night-light type effect. It’s a good idea to put the bathtub lighting on a separate dimmer switch to allow for a relaxing soak in the tub. The Powder Room offers an opportunity to get creative with your lighting. Since this area is not generally used for grooming, the lighting can be very dramatic. Place fancy wall sconces on either side of the mirror or hang pendants for a true design statement. Also, remember to provide light for a niche or artwork. If the sink or faucets look like a work of art themselves, highlight them with a narrow, halogen spot light from above. Remember that dark colors absorb light, so plan for more than you think you need and use a dimmer. Also, small rooms need more light than larger rooms as there are more walls and surfaces to absorb the light. What is the best way to light my bathroom vanity area? For shaving and putting on make-up, the best light should be even and shadow-free. To achieve this, light should come from above and both sides. Wall sconces should be at least 28 inches apart and centered 60 inches off of the floor. Of course, taller or shorter people can adjust this guideline.